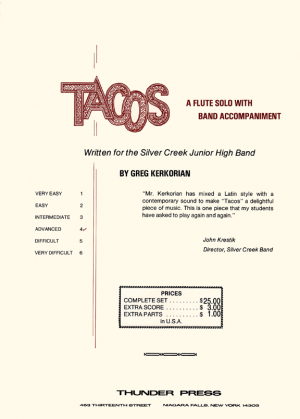 Tacos is a delicious flute solo with band accompaniment. Written in a Latin style, it provides a slick background to showcase your young player. This tasty choice can really spice up your concert. Here is a full sounding and pretty original with loads of pizzazz! Very tasty and slick, and very nice to listen to. This is Christmas music written in a march style with a pleasant mix of holiday favorites and presented in tongue in cheek fashion. It might even be considered a novelty and can lighten and brighten your winter concert.